German Sterligov is building a computer-based barter system. Photo by Alexander Natruskin/Reuters. 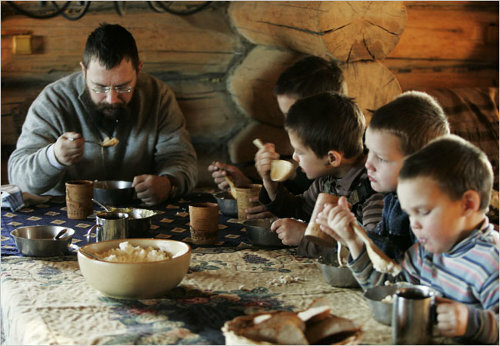 Barter is back in Russia, reports [The New York Times](http://www.nytimes.com/2009/02/08/world/europe/08barter.html?_r=1). Advertisements are beginning to appear in newspapers and online, like one that offered “lumber in Krasnoyarsk for food or medicine”. A crane manufacturer in Yekaterinburg is paying its debtors with excavators. In the mid-1990s, barter transactions in Russia accounted for an astonishing 50 percent of sales for midsize enterprises and 75 percent for large ones. The practice kept businesses afloat for years but also allowed them to defer some fundamental changes needed to make them more competitive, like layoffs and price reductions. It also hurt tax revenues. German Sterligov, one of the first Russian capitalists, plans to use a computer database to create chains of six or seven enterprises having difficulty selling their products for cash, in which the last firm on the chain would pay the first in a single cash transaction. “What was in the past will remain in the past”, Mr. Sterligov said. “We are making a step into the future”.